In day-to-day life, our skin comes in contact with number of pollutants, germs and impurities. Our face gets the maximum exposure that is why these impurities and dirt get settled down on our face. This pollutes the skin and damages it in many ways and give rise to problems like pimples, acne and blemishes. People have been utilizing the powers of Ayurveda since ages and getting benefits from it. One of the effective ayurvedic ingredients is Neem. This wonder leaf gives multiple skin benefits like healing scars, fights acne/pimples, treats pigmentation, oil control, moisturizes the skin and treats skin infections. 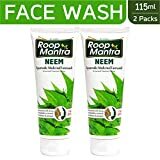 Keeping all these points in mind, Roop Mantra brand has combined the Ayurveda and modern science and created a wonderful formulation Roop Mantra Neem Face Wash. This herbal face wash is soap free invention and the natural ingredients of it work in a gentle manner on your face. This is a safe and natural product and does not affect the skin’s quality and texture. This dirt cleaning face wash exfoliates the skin and makes it dirt and germ free. This, in turn, makes the skin flawless, healthy and glowing. It works on your skin at a rapid rate and keeps it soft and supple. A natural blend of Neem, Tulsi and Haldi (turmeric) bring together in just one pack for you. The combined antibacterial and antifungal properties are effective in preventing the recurrence of pimples, blackheads or whiteheads, blemishes and acne over time. 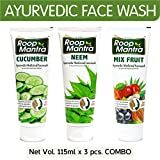 The antibacterial properties of this best Neem face wash helps to improve the general skin health and immunity. Also fights the bacterial infections like acne, boils, and ulcers. Plus turmeric is also a component of this pimple removal face wash and its antiseptic properties even out your skin tone and retain the elasticity of the skin.